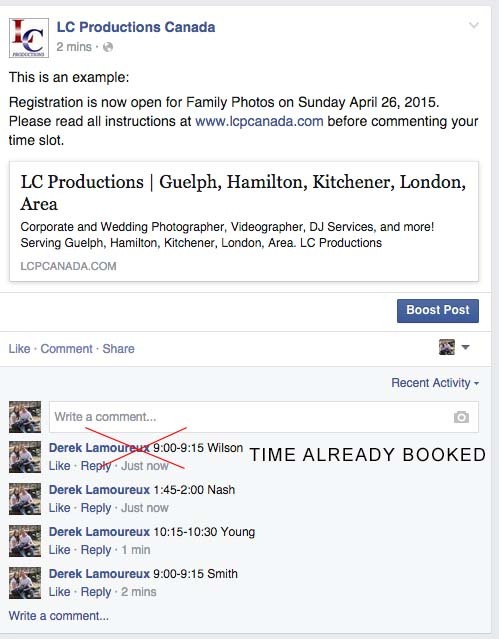 As many of you have heard, I, Derek Lamoureux, owner of LC Productions would like to give back to the community of Strathroy by arranging complimentary family photo sessions. Below is all the information required to make the day enjoyable for everyone. Please read the following carefully. Each family will have 15 minutes to have their photos taken. So please have your family organized and ready to go 10 minutes before your scheduled time. We understand that pets may be a big part of the family. However, in order to respect the golf course property we ask that all pets remain at home. The day will be broken down into 15-minute time slots (9:00-9:15, 9:15-9:30, etc.). In order to accommodate as many families as possible, we ask that each family only register for one time slot. Registration will take place Monday April 27, 2015 at 1pm on our Facebook Page using the comment function. Time slots are on a first come first serve basis. At 1pm we will post as status and at this time please comment your last name and the time slot you want. It is your responsibility when you register for a time slot to make sure it hasn’t been already booked. See below. A big thank you to Denton of Caradoc Sands Golf Course in Strathroy who has generously offered to let us use their beautiful facilities. This is a complimentary event for Strathroy families. However we will have a donation box for families who would like to donate money towards the Strathroy Middlesex General Hospital Foundation. We really want to have fun with this event and ask for everyone’s cooperation in following the above guidelines to ensure the day runs smoothly. We highly recommend following us on Facebook to keep up to date with any changes that may occur.